Crown has announced the brand new DCi-ND AVB amplifier this week at InfoComm 2014. Yes, that’s right, Crown brought us an AVB amplifier. AVB baby! Crown has announced the brand new DCi-ND AVB amplifier. I’ve been talking all about how this should be the breakout year for AVB—just like I did the year before and even the year before that. And yet, this really might be the year, because as you probably know, Crown/Harman is a big Dante/BLU link shop, so for them to get behind AVB like this is quite impressive. The DCi-ND AVB amplifier is currently shipping, with stock physically in the country. That makes me happy. Why? Because this isn’t another product that's delayed shipping until next quarter, or even next year. No, it's sitting on shelves now, patiently awaiting your PO. 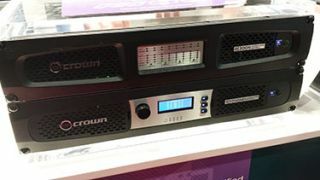 More importantly, by adding AVB technology to their popular DCi line, which already boasts analog, BLU link, CobraNet, and Dante compatibility, Crown/Harman's approach enables users to spec their Crown DCi amps and pick the network transport they want. They've essentially put the power into the hands of their dealers, ensuring that you've got options while sticking within one line. If anything, the addition of AVB to Crown's lineup offers a glimmer of hope that AVB is here to stay and maybe, just maybe, 2014 will finally be a breakout year for AVB.